The Microsoft IoT in Action event came to Sydney for the first time on March 19, 2019, and it attracted a large audience of partners and end-user organisations. Perhaps 70 percent of IoT projects are focused on connecting and monitoring systems, estimated Tony Shakib, General Manager Azure IoT, Microsoft. Of course, there’s scope to take IoT much further. For example, IoT data could be used to ensure new buildings comply with safety regulations. That’s according to Joshua Ridley, CEO of Willow, the Australian Microsoft partner that’s created a Microsoft Digital Twins-based platform for creating virtual models of buildings. “What if, through digital twins, we could give radical transparency to compliance and governance, such that we’ve never seen before?” Ridley said. Microsoft partners are also using IoT to streamline customer service. For example, one has created a ‘smart service’ system that helps restaurant customers let their waiter know they’re ready to order via a connected wristband. The system also allows restaurant owners to monitor service levels and helps ensure capacity for the busiest hours of the day. Meanwhile, US company SlantRange is enabling farmers to forecast crop yields before harvesting. Drones collect information about plant pigment, shape, size and distribution, and that data is combined with other information, such as weather and irrigation data. The common link between all these solutions – in addition to the use of the Microsoft IoT stack – is they were designed with well-defined business outcomes in mind. There are plenty of reasons why organisations will benefit from using IoT solutions that share common underpinnings, such as the Microsoft IoT platform. For example, organisations can reduce complexity by purchasing multiple solutions that use the Microsoft IoT stack, instead of using non-interoperable, single-purpose IoT solutions. A common IoT stack also saves time. By developing solutions that work on the Microsoft IoT platform, companies don’t have to build multiple versions, as Rodney Clark, Vice President IoT Sales, Microsoft pointed out. “If you build a capability on one cloud platform and you also build it on another, you have multiple development environments, your resources are splintered, and you’ve got to borrow expertise from one side or the other. Your costs go up,” Clark said. “When we ask companies what they would have done differently, this is the number one thing they say: ‘We wish we had just gone with one [platform]’,” he said. It’s important to think about the capabilities that might be needed through the entire IoT stack. At a basic level, companies might want a seamless and reliable way to control IoT devices via the cloud. And they might want a way to automatically provision hundreds or even thousands of devices. Another consideration is whether the platform supports edge computing. It might be necessary to process data at the device if data connectivity is limited, or if the business needs to respond rapidly as data is collected. It’s also important to think about whether the IoT platform connects seamlessly to advanced data processing services. For example, farmers will want access to AI models relevant to their industry. And if they want to combine it with geospatial or weather data provided by other parties, they’ll need an IoT platform that makes that possible. The choice of IoT stack is also an important factor in device security. For example, not all IoT devices have automatic security updates or use certificated based authentication – two features of Microsoft Azure Sphere-based devices. To learn more about this, attend the upcoming Azure Sphere webinar from Microsoft. 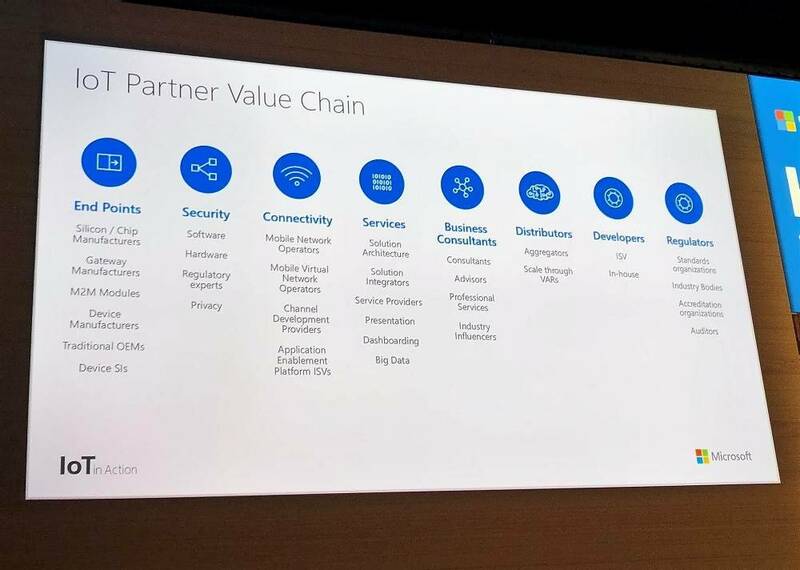 There’s no shortage of opportunities for IT suppliers to find a place in the Microsoft IoT ecosystem, as the image above shows. That includes opportunities to work alongside other partners, Clark pointed out “It takes multiple partners. If you’re a customer on the receiving end of an IoT solution, I know you’ve had to work with a number of companies to make this happen. If you’re a partner, I know you’ve had to reach left and right across the ecosystem to bring in capability,” Clark said. The Microsoft IoT solutions can reduce the heavy lifting for partners – as the image above illustrates. 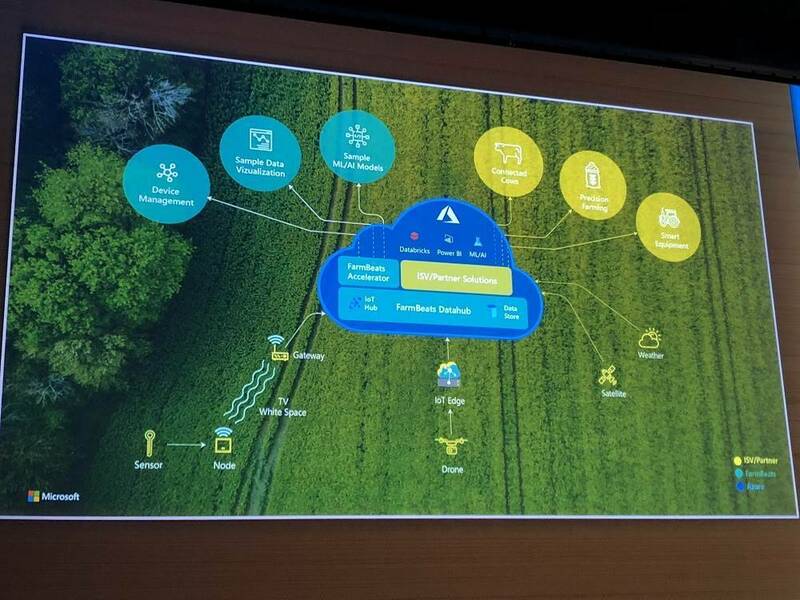 Partners supply the solutions shown in yellow, while the Microsoft IoT offerings (shown in blue) provides the cloud environment, data store, edge computing, device management tools, AI models and data visualisation capabilities. Learn more by tuning in for the IoT in Action Webinar Series.